In most Koi foods wheat flour is a major ingredient, and is used primarily as a cheap filler, unfortunately Koi carp have difficulty digesting this ingredient. If you find your present Koi food produces high levels of waste, look carefully at the ingredients list on the container. Elite All season has been specifically formulated to remove all wheat flour, allowing greater digestibility at varying temperatures. 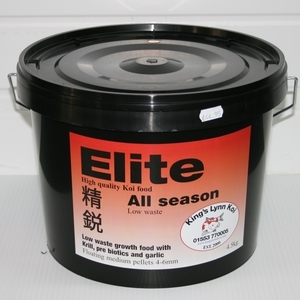 Elite all season contains high quality White Fish Meal, Antartic Krill Kusuri Klay, ‘Optimum’ food enhancer and Pre-biotics as well as many other high quality ingredients. Key benefits include: Low levels of waste Garlic to reduce parasitic infestations. Kusuri Klay for better digestion of up to 22%.Antartic Krill, Spirulina, Shrimp Meal to improve colour.